Every summer since 2003, I’ve been a participant in the Acoustics Workshop sponsored by the Violin Society of America at Oberlin College in Oberlin Ohio. This gathering, co-directed by D’Addario string engineer Fan Tau and violin maker Joseph Curtin, consists mostly of accomplished professional violin makers and scientists who study the physics of violins. 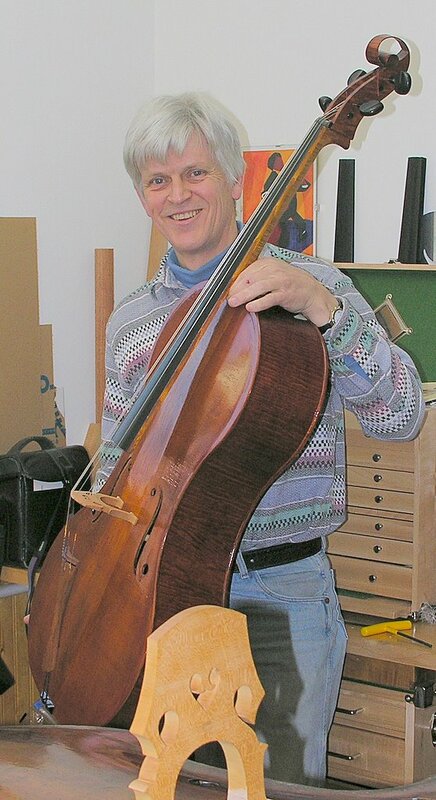 At the 2004 Workshop, there was one participant who didn’t really fit either category-Douglas Martin-a maker of competition rowing shells who had made a few bizarre, strangely shaped violins out of Balsa wood. It was evident to me and to Joseph Curtin that even though they were strange, they were nevertheless acoustically amazing. 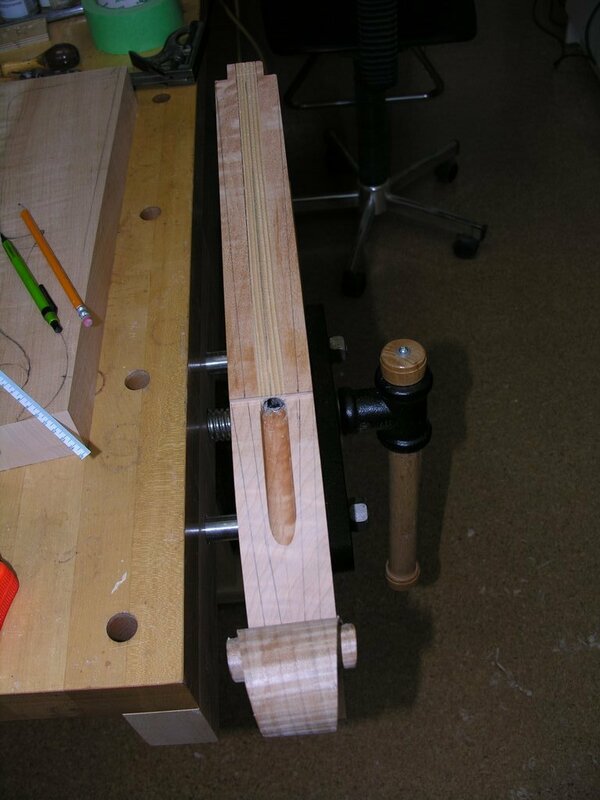 One Balsa violin in particular had very unconventional neck dimensions and a very crude bridge. I helped Doug to reshape the neck and since one of the projects going on at the Workshop was a study of bridge acoustics with several world class violin makers participating, I said “Doug, there’s a whole row of world class bridge fitters, why don’t you get a decent bridge for this fiddle?” That was done and the result was an even more remarkable sounding violin which now felt much more normal to play. That evening, I was hanging out in the hallway with Joe Curtin as we passed Doug’s Balsa violin back and forth playing it and marveling at its sound. I could see the wheels turning in Joe’s head as he played it and we agreed that despite its weirdness, this violin had power and responsiveness matched by few if any conventional violins. Later the legendary violin restorer Rene’ Morel who was a faculty member of the concurrent Violin Setup Workshop came in with a group of Setup Workshop participants. Seeing the Balsa violin, someone said “Rene’, can you set up this violin?” Rene’ was equal to the challenge and pulled his sound post setter out of his pocket and darn if he didn’t make it sound still better! By this time the Balsa violin sounded really great. The following day, while we were waiting in line for our group dinner, I had the opportunity for an introduction. When I said “Rene’, this is Doug Martin who made the Balsa violin” Rene’ said to Doug “You made that? That’s the best sounding box I ever heard!” Well that’s probably a big exaggeration, but coming from the man who has probably had on his workbench more great Cremona masterpieces than anyone else alive, it’s obvious that he was impressed! In the time since then I’ve been trying to understand why that Balsa violin worked so well. One reason I think is basic high school physics, F=MA (force equals mass times acceleration). If the mass of wood that is set in motion by the force of the bow to in turn vibrate air (sound is vibration of air) is reduced, the effort required to produce that sound will be proportionally reduced. That explains why the violin was so amazingly responsive, but I’m sure there’s more to it than that. 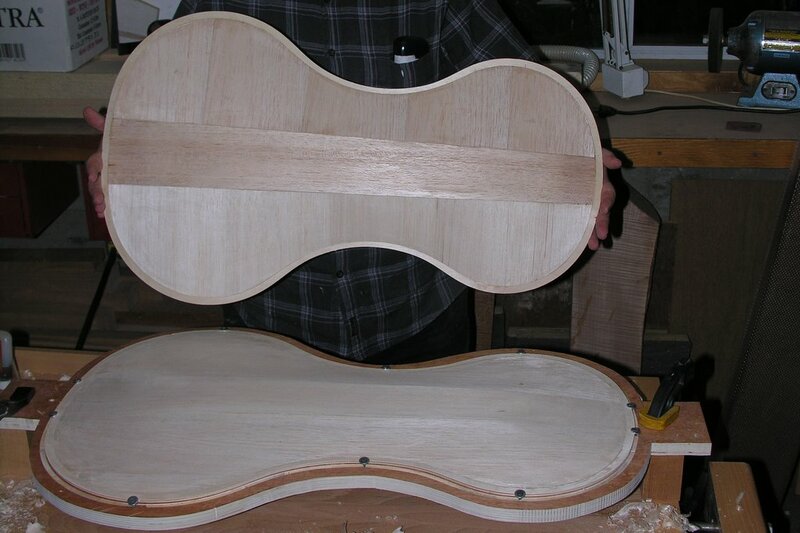 There are three physical properties of wood that are critical to its effect on the sound of musical instruments. They are stiffness, density and damping. Stiffness and density are easy to explain and measure but damping is much more complex. I think Balsa has damping properties that are unique and desirable for bowed instruments. Balsa is not very stiff but is extraordinarily low in density. 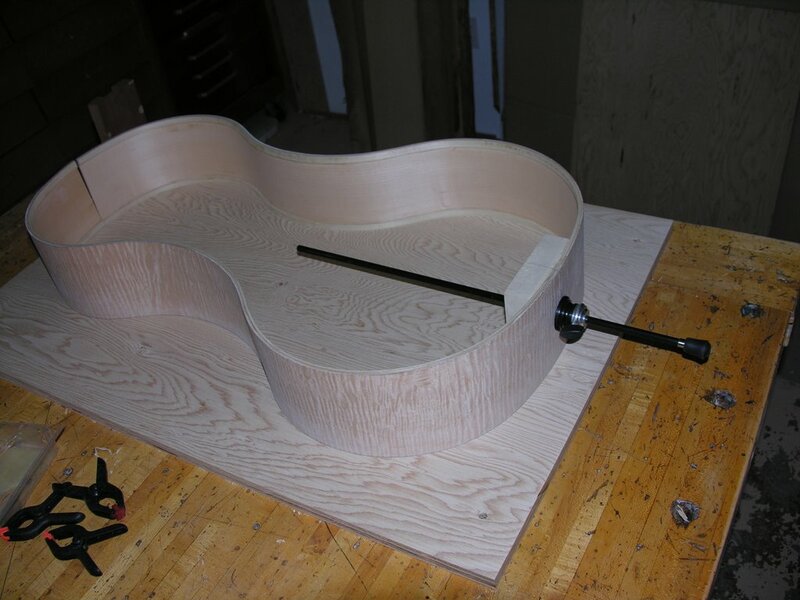 Because as any engineer knows, the bending stiffness of a beam is proportional to the cube of its cross-sectional dimension in the direction of bending, a beam (or violin top) that is twice as thick will be eight times as stiff. So, if that top is half as dense (Balsa can be half as dense as Spruce) and half as stiff (Balsa is about half as stiff as spruce) but twice as thick, it will still be twice as stiff overall for the same mass! What this means is that using this unique material, it is possible to make an extraordinarily light weight instrument which will have approximately the same structural stiffness as a conventional one. Furthermore this instrument can have the unique damping properties of Balsa. 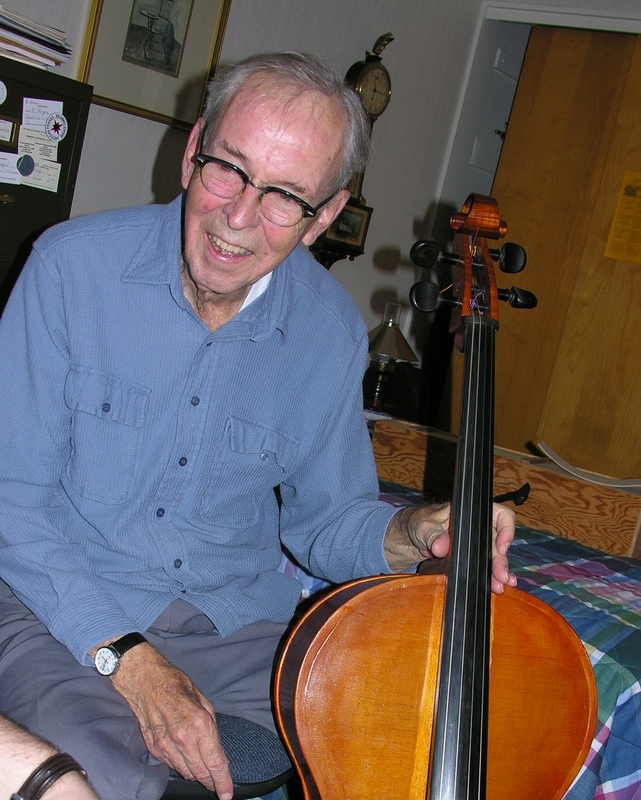 Scientist/violin maker Ted White, who lives near me, was a participant at the 2005 Oberlin Acoustics Workshop. 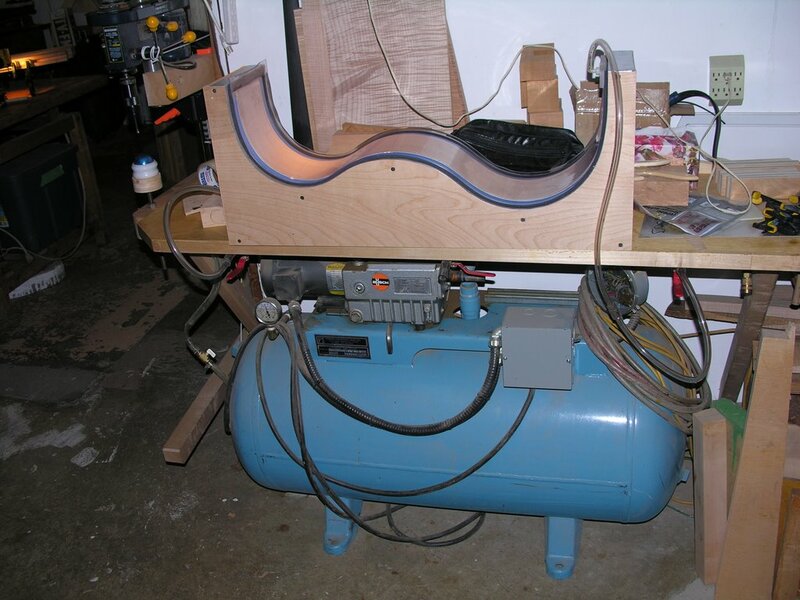 Since we were both excited by the possibilities of ultra-light Balsa instruments, and Ted makes violins while I make basses, we decided to collaborate on making a Balsa wood ‘cello! We wanted to make something that pushed the limits as far as we dared but would still feel completely conventional to a ‘cellist and look at least a bit more normal than Doug’s instruments. We realized that to take maximum advantage of the new materials, we couldn’t just substitute the new material into a conventional design but would need to use a different structural design. We completed the ultra-light ‘cello (made in only 2 months!) 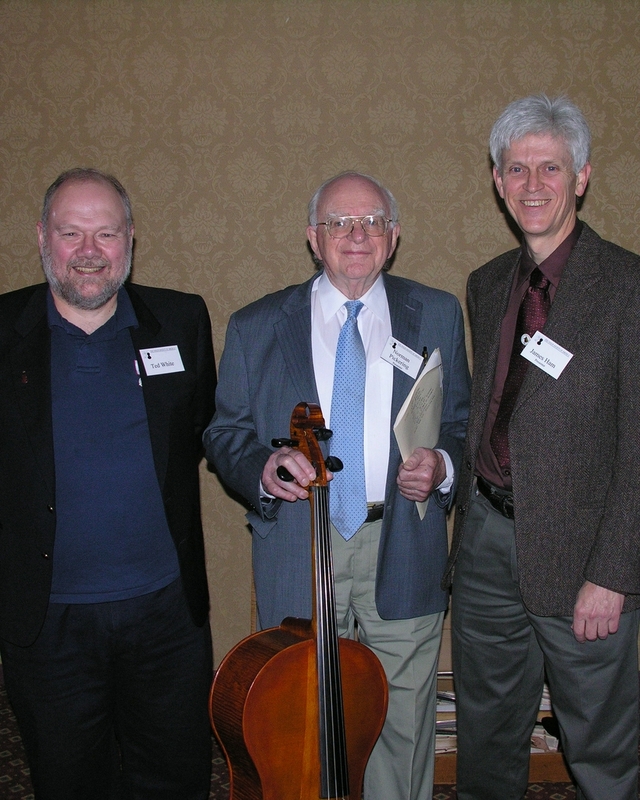 in time for it to be demonstrated at the November 2005 convention of the Violin Society of America in Philadelphia. Since that time, I have invited many top-flight ‘cellists to play it and to my amazement, there has been very little negative reaction to its appearance or unconventionality. The usual scenario proceeds from initially being afraid to play it vigorously for fear of breaking it to realizing that there is no problem playing it normally and then being amazed at how good and powerful the sound is and how easily it plays. 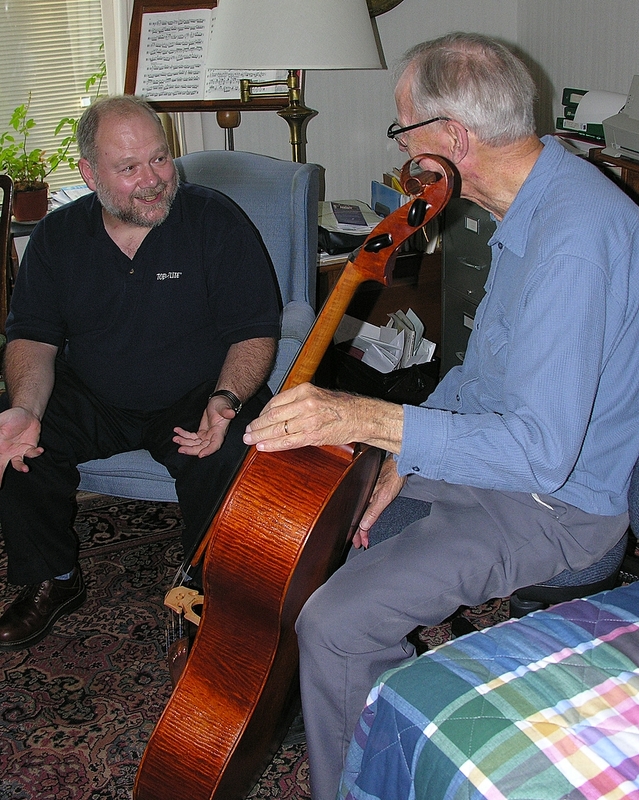 A typical response came from a Chicago Symphony ‘cellist who said “when can I get one of these?” Ted and I are working on the next version of the ultra-light ‘cello with the intention of making an instrument with a more professional standard of workmanship for eventual sale. 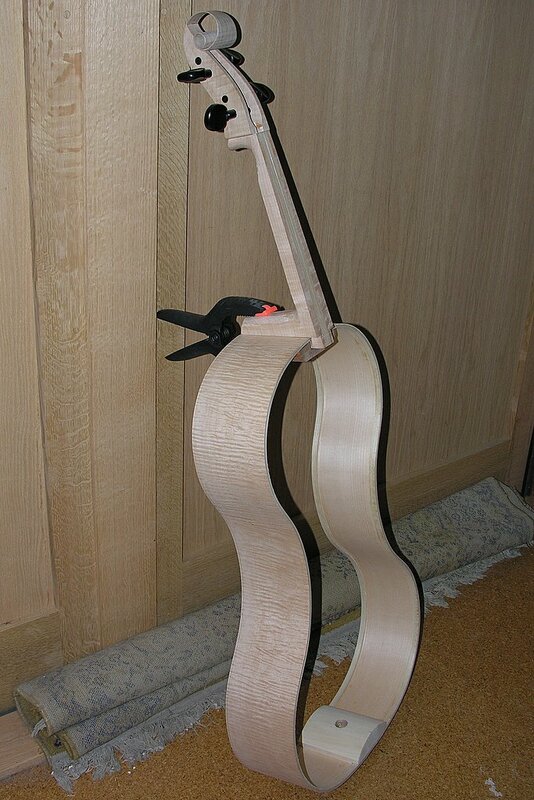 I also plan to make an ultra-light bass, viola and violin. Stay tuned! A few details: The ultra-light cello weighs about ½ as much as a normal ‘cello. 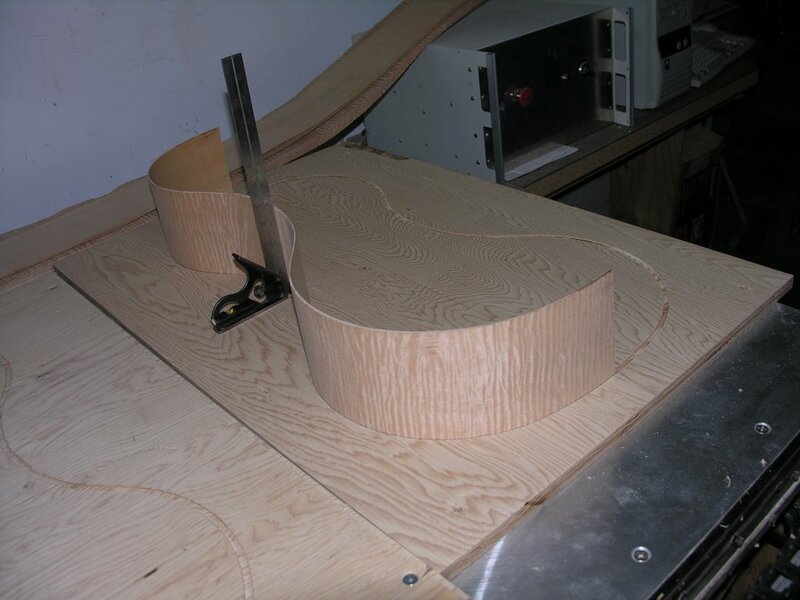 The ribs are a sandwich of Balsa between Maple veneers made using the same vacuum technique that I use for my bass ribs. 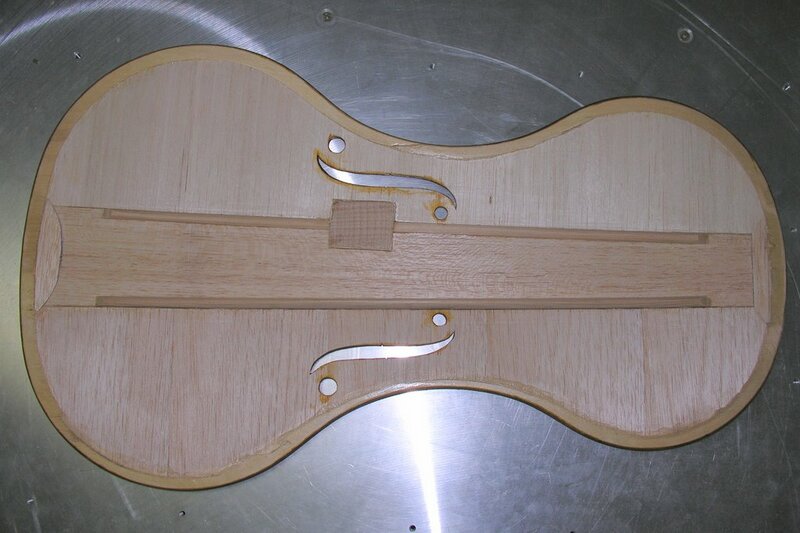 The neck is made of Maple but hollow and reinforced with a carbon fiber tube. 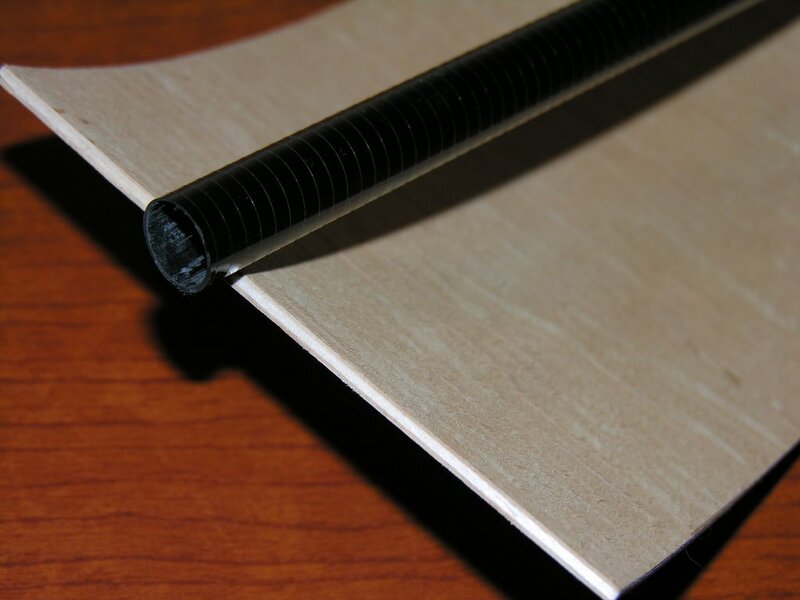 The scroll is made of laminated Maple veneer. 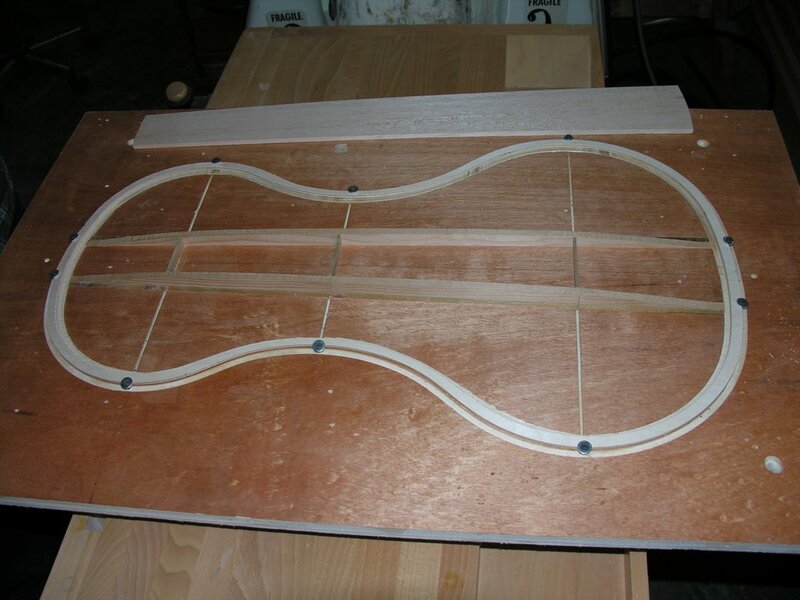 The top and back were made of flat panels of Balsa using a computer and CNC machine to create templates for cutting out the panels with the exact shape required such that when glued together, they would bend to the same long arching shape as a Strad. ‘cello. There is a bass bar in the usual place but there are also two “treble bars” one on the top and one on the back with platforms for the ends of the sound post to rest on. Of course I had to give it an adjustable neck! Here are some pictures of the ultra-light ‘cello. In addition to Ted White and myself, I’ve included pictures of Norman Pickering and the late Oliver Rodgers. These men are giants in the world of string instrument acoustics and I am greatly privileged to call them friends. 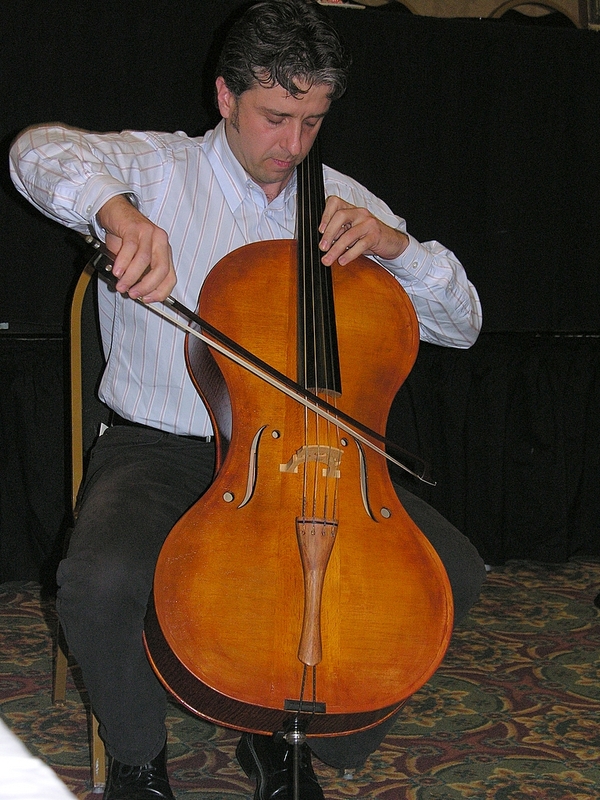 The ‘cellist in the photo is Roman Borys of the Gryphon Trio who demonstrated the ‘cello at the Philadelphia VSA convention. 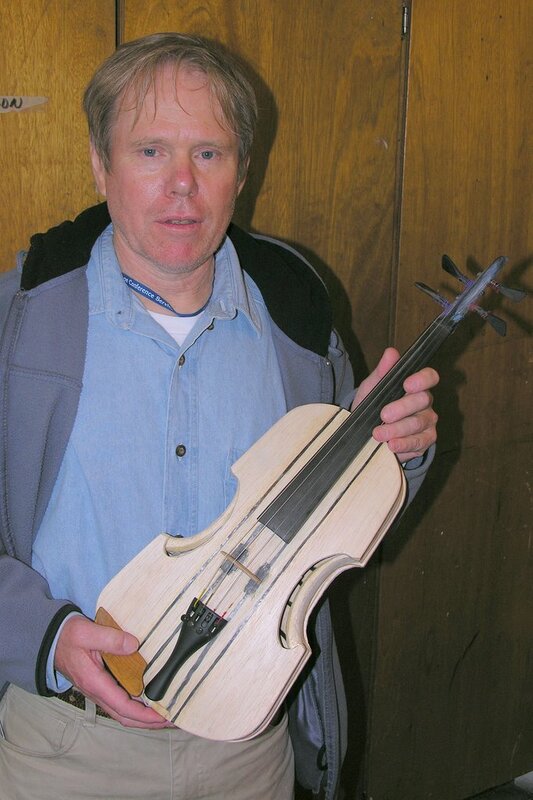 I've also included a photo of Doug Martin and his amazing Balsa violin.